In conjunction with the Midwest Chapter Plainly Spoken exhibit opening at the Minnesota Center for Book Arts in Minneapolis, Karen Hanmer will be teaching a workshop on Gilding and Colored Edge Decoration Techniques. For more information and to register, visit the MCBA website. The traveling Midwest Chapter exhibition Plainly Spoken will be at the Minnesota Center for Book Arts from February 6, 2015 through April 26, 2015. There will be an opening reception on Friday, February 6; 6-9pm, with a gallery talk at 7:30 by featured artists Karen Hanmer and Jana Pullman. This event is free and open to the public. Announcement: a Midwest Traveling Set-Book Exhibit! We mentioned at last year’s annual meeting that there will be an opportunity to be a part of a Midwest traveling exhibit. This will be a juried set book exhibit using Julia Miller’s “Books Will Speak Plain.” There is still much to be decided, but details for entry will be available soon. Since the book came out some time ago, the copies that are in sheets are limited. However, if you know you want to submit an entry, you can buy them at Hollander’s. 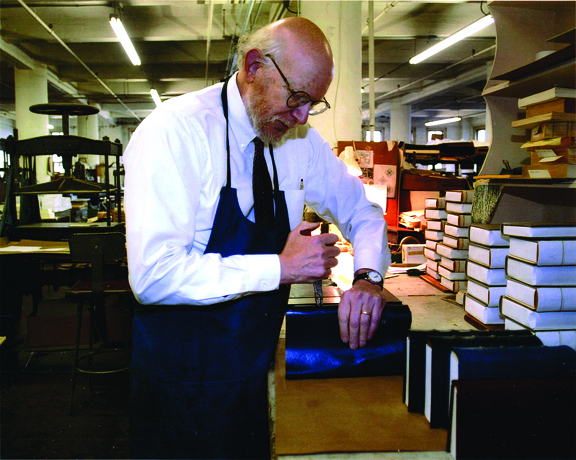 (under “Bookbinding Supplies,” then “Text Blocks”) or rebind a bound copy. Stay tuned to the Midwest website and your inboxes. I think it will be a great show! There will be a lecture on Friday evening (details to be announced). The 2 day workshop is an introduction to traditional leather bookbinding. Participants will prepare pre-sewn texts for leather binding. They will learn how to cut and pare leather, mix paste, and how to cover books. There will also be instruction in the formation of headcaps, working with raised bands, and preparing and attaching corners. All methods are traditional, techniques are reversible, and materials are archival. To register for either workshop and save your spot, please contact the Midwest Programs chair, Mary Uthuppuru (mary@springleafpress.com). The workshop with Sam Ellenport at Illinois State University has been postponed. Check back for updates on when the workshop will be rescheduled. This 2 day workshop is an introduction to traditional leather bookbinding. Participants will prepare pre-sewn texts for leather binding. They will learn how to cut and pare leather, mix paste, and how to cover books. There will also be instruction in the formation of headcaps, working with raised bands, and preparing and attaching corners. All methods are traditional, techniques are reversible, and materials are archival. For more information and to register, please email the Midwest Programs Chair, Mary Uthuppuru at mary@springleafpress.com.